D.C. police released more photos Tuesday of ATV riders who illegally rode through streets on dirt bikes and ATVs late last month. Officials are seeking the public's help in identifying those captured on camera. Dozens of dirt bike and ATV riders wove in and out of vehicle and pedestrian traffic June 25 in National Harbor, Maryland. Riders also were seen in D.C. on Pennsylvania Avenue, on H Street NE and near the Tidal Basin. Go to the gallery above to see photos of every person of interest police have released so far. 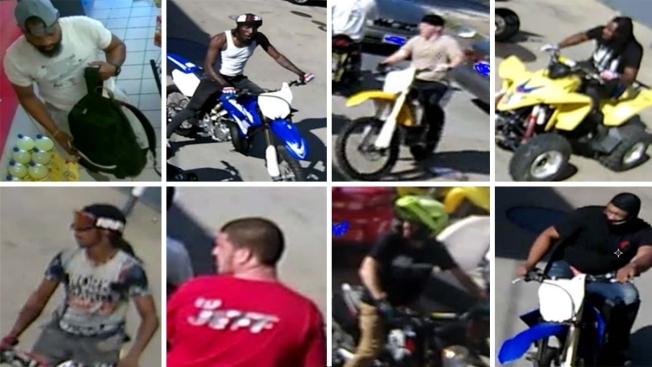 Police have released photos of 54 men they say illegally tore through streets on dirt bikes and ATVs. News4's Darcy Spencer reports how residents are reacting to the ATV riders. "People are sick and tired of this behavior in our community," D.C. Police Chief Peter Newsham said at a news conference June 30, the day authorities released the first batches of surveillance images. "This behavior is reckless, it's dangerous, it terrifies our kids, our moms, our dads, our seniors," he continued. "And it's pathetically, in my opinion, juvenile -- grown men acting like juveniles." ATV riders can expect to be monitored in Prince George's County by the police aviation unit, with video surveillance and by officers on dirt bikes and ATVs. News4's Darcy Spencer and Tracee Wilkins report. Police have information to believe that some of the riders came from as far away as Florida and Indiana, Newsham said. The June 25 incident was scary, a witness at National Harbor said. "People were just trying to get out of the way," he said. The man, who asked not to be identified, said he was worried someone could get hurt. Police tried to stop the riders, but they got away. 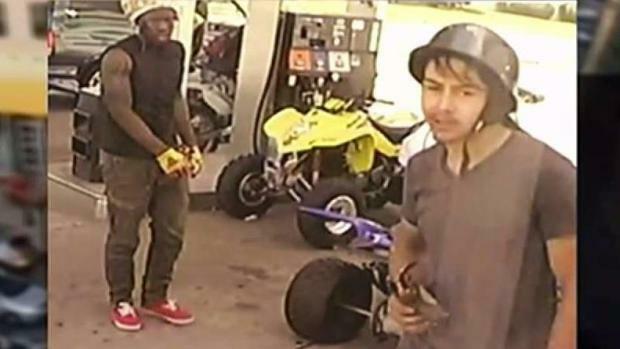 Photos from Prince George's County Police showed several men with ATVs and dirt bikes at a gas station. Police said three men shown in the photos are suspected of armed robbery. A man tried to sell a dirt bike online. When he met with the seller, the men held him up at gunpoint and took the bike without paying, police said. That incident was not related to National Harbor, they said. Prince George's County Police have promised to do everything they can to get the riders off streets. "I have personally met with our legislators down in Annapolis, and they are actually working on legislation to ensure we get stiffer penalties for those who engage and indulge in this type of activity," Prince George's County Deputy Police Chief George Nichols said in the wake of the incident. It's illegal to ride a dirt bike or ATV anywhere on public space in D.C. or Prince George's County. D.C. police are offering a reward of as much as $250 for information on the riders. Call 202-727-9099 or send a text to 50411.